Is your garage home to a piece of timeless history? Do you spend your afternoons behind the wheel or under the hood or maybe just sitting out on the front steps, staring at it in the driveway? 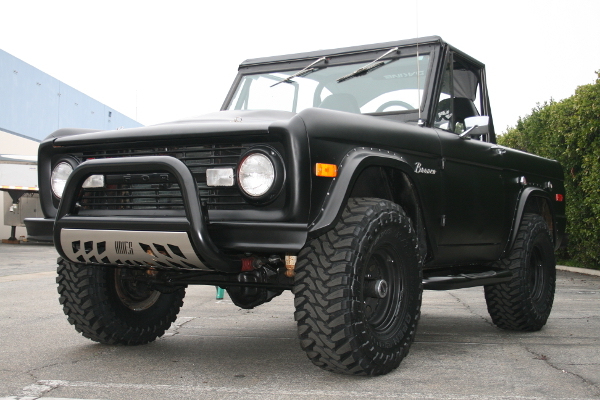 Do you love the idea of restoring an old truck to its former glory and adding a few bells and whistles along the way? Whatever era you love best – from classic to modern – ARIES offers a wide range of vehicle-specific accessories to provide you with a custom fit on your truck, Jeep or SUV. With hundreds of applications going back as far as the 1960s, we have the fit, form and function to complement your ride. For an original equipment look on your pickup truck or SUV, ARIES 6” oval side bars are a perfect match. They are designed to mimic the look of popular OE side bars on a variety of makes and models. They are available in polished stainless steel or black powder-coated aluminum, and they install with no drilling required. Our 4” oval side bars are another excellent side step option, providing a solid step and a classic look. They feature an elliptical tube profile with 20° bent ends. They have raised step pads for more comfortable footing, and the pads are custom-positioned to match the vehicle layout. 4” ovals are available in polished stainless or black powder-coated steel. ARIES 3” round side bars and 3” bull bars are available for hundreds of vehicle applications, providing a custom fit for many older trucks and unique makes and models. We also offer two different material and finish options to complement the look of any vehicle, including polished stainless steel and black powder-coated steel. Both our side bars and bull bars mount with no drilling required. For added front-end protection on your truck, Jeep or SUV, add an ARIES grille guard. Like our 3” side bars and 3” bull bars, ARIES grille guards are available for hundreds of applications, including several older models. They feature a custom fit with no drilling required and offer pre-drilled mounting points for installing aftermarket lights. Choose from polished stainless or black powder-coated steel. Make your truck cab safer as well with an ARIES classic headache rack. This all-steel, powder-coated headache rack is strong and fully louvered to defend your rear window and keep direct sunlight out. It installs with simple flat steel brackets and is compatible with cross-bed tool boxes. Finally, keep the interior of your truck, Jeep, SUV or even classic car clean with ARIES Seat Defenders™. These unique seat covers are designed to be used as needed, being easy to install and remove at a moment’s notice. They offer waterproof protection for your seats without detracting from the look and style of the interior. Seat Defenders™ are available for bucket seats, bench seats, XL bench seats and the cargo area.